History of Present Illness: The patient noticed a slow decreased vision at distance and near, more so in the right eye than the left. She was having increasing difficulty with glare from bright lights at night, seeing road signs, watching television, and reading the newspaper. Six years ago, she had been told that she had a cataract in the right eye. No history of eye surgery or trauma. Review of Systems: A full review of systems was negative except for what is mentioned in the history of present illness. A manifest refraction was not performed at this time given her poor vision and dense cataracts. Pupils: Equally reactive in each eye from 4mm in the dark to 2mm in the light. No relative afferent pupillary defect. 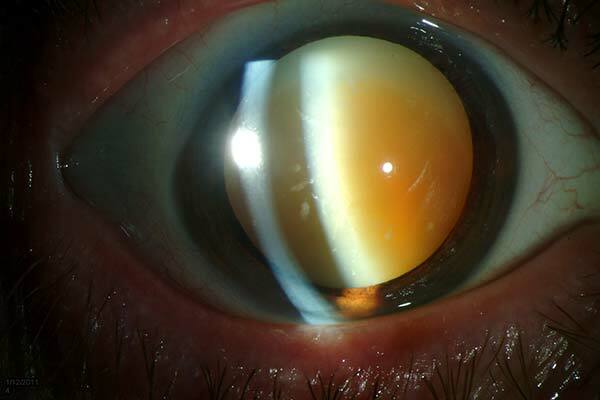 A Morgagnian cataract arises when a cortical cataract becomes hypermature. A cortical cataract is an opacity of the lens cortex or periphery of the lens. An early cortical cataract is often clinically diagnosed by spoke-like or wedge-shaped opacities of the lens, most commonly in the inferior quadrants. As the cataract matures, the lens fibers degenerate, leaving cytoplasmic protein globules between the fibers of the cortical lamellae. Increasing amounts of cortex degenerate with time, and the globules begin to coalesce creating large accumulations of liquefied lens protein. When the majority of the cortex is affected, the lens nucleus is left floating in the liquid cortex, forming a Morgagnian cataract (Albert 2008). Eyes with hypermature or mature cataracts may develop a form of secondary elevated intraocular pressure referred to as phacolytic glaucoma. Because of the increased concentration of protein molecules under the lens capsule, water is drawn from the aqueous into the lens capsule via osmosis. This may result in a swollen, tense lens capsule. Lens proteins may leak from microscopic rents in the capsule. These proteins trigger a non-granulomatous inflammatory response. Macrophages collect in the anterior chamber and phagocytize the free lens proteins. Both the protein-laden macrophages and the protein itself clog the trabecular meshwork, hindering aqueous outflow and causing elevated intraocular pressure (BCSC 2010). With the increase tension on the lens capsule, there is an increased risk of spontaneous capsular rupture or rupture with only mild trauma. Exposure of the lens nucleus and cortical material to the anterior chamber after rupture can cause a severe granulomatous inflammatory reaction, phacoantigenic endophthalmitis. On histology, the lens material is surrounded by multinucleated giant cells, lymphocytes, and histiocytes in concentric layers (BCSC 2010). Decreased vision secondary to a Morgagnian or hypermature cataract can be significantly improved with surgical removal of the cataract. However, creation of a continuous curvilinear capsulorhexis is more challenging in this situation. The increased intralenticular pressure can cause uncontrolled tearing of the lens capsule. In addition, the surgical view may be poor secondary to lack of red reflex as well as leak of liquefied cortical material into the anterior chamber after making the initial opening in the capsule. Techniques have been described in the literature to improve visualization and decrease radial capsular tears, resulting in a successful capsulorhexis. To improve the surgical view, general recommendations include dimming the operating room lights and increasing microscope magnification and coaxial illumination. Trypan blue is often used to stain the anterior lens capsule. It provides uniform capsular staining and enhances the contrast between the anterior capsule and the underlying lens, improving visualization of the anterior edge of the capsulorhexis (Jacob et al 2002). Mansour (1993) used side illumination with an endoilluminator in order to improve visualization with a compromised red reflex. The advantage of the endoilluminator is that it could be continuously repositioned to identify the advancing edge of the capsular tear. Various techniques have been tried to decrease the risk of uncontrolled capsular tears. Gimbel and Willerscheidt (2003) described a two-stage capsulorhexis where first a deliberately small continuous curvilinear capsulorhexis is made, the liquefied lens contents are aspirated, and then the capsulorhexis is secondarily enlarged. Kara-Junior et al. (2009) compared this two-stage capsulorhexis technique to the traditional one-stage 5 to 6mm capsulorhexis technique and found fewer unexpected radial tears with the two-stage technique. Bhatterjee et al (1999) first created an anterior capsular opening with a needle and then intermittently aspirated the liquid material until the lens capsule was decompressed. Then the endoillumination technique, as described by Mansour, was used to complete the capsulorhexis. Alternatives to the traditional creation of the capsulorhexis include using a neodymium:YAG laser to create an anterior capsulotomy just prior to surgery (Richards and Harrison 2002). The Yag laser created a small anterior capsulotomy through which the liquefied cortical material is released into the anterior chamber, decreasing intralenticular pressure. Hausmann and Richard (1991) used a bipolar diathermic capsulotome as an alternative to capsulorhexis to create a round anterior capsulotomy. After a successful capsulorhexis is created, there are few differences in technique compared to that of a less advanced cataract. Hydrodissection or hydrodelineation is not necessary as the nucleus is already mobile within the capsule. Sato et al (2008) described a visco-shell technique where, after the capsulorhexis, sodium hyaluronate 2.3% (Healon5) was injected gently into the capsular bag between the nucleus and the posterior capsule. Additional Healon5 was then injected between the nucleus and the cornea. This wrapped the nucleus in viscoelastic, both stabilizing the nucleus for removal while protecting both the posterior capsule and the cornea. For removal of the nucleus, phaco-chop may be a successful technique for removal of the nucleus. A divide and conquer technique is more difficult because the lens nucleus is floating freely in the capsular bag. If the lens nucleus is particularly hard, Vasavada and Singh (1999) used a chop, chop, and stuff technique where the chopper guides small pieces to the port and then stuffs them into the lumen, decreasing aspiration flow rate to keep the energy and vacuum at lower levels. In summary, various surgical techniques can be used to improve visualization and control the creation of a capsulorhexis in hypermature cataracts. Albert D, Miller J, Azar D, Blodi B. Cataractogenesisi in the Adult. Albert & Jakobiec's Principles and Practice of Ophthalmology. Philadelphia: Saunders Elsevier Inc, 2008. Bhattacharjee K, Bhattacharjee H, Goswami BJ, Sarma P. Capsulorhexis in intumescent cataract. J Cataract Refract Surg. 1999 Aug;25(8):1045-7. Gimbel HV, Willerscheidt AB. What to do with limited view: the intumescent cataract. Cataract Refract Surg. 1993 Sep;19(5):657-61. Hausmann N, Richard G. Investigations on diathermy for anterior capsulotomy. Invest Ophthalmol Vis Sci. 1991 Jun;32(7):2155-9. Jacob S, Agarwal A, Agarwal A, Agarwal S, Chowdhary S, Chowdhary R, Bagmar AA. Trypan blue as an adjunct for safe phacoemulsification in eyes with white cataract. J Cataract Refract Surg. 2002 Oct;28(10):1819-25. Kara-Junior N, de Santhiago MR, Kawakami A, Carricondo P, Hida WT. Mini-rhexis for white intumescent cataracts. Clinics (Sao Paulo). 2009;64(4):309-12. Mansour AM. Anterior capsulorhexis in hypermature cataracts. J Cataract Refract Surg. 1993 Jan;19(1):116-7. Ophthalmic pathology and intraocular tumors, section 4. Basic and Clinical Sciences Course. San Francisco: American Academy of Ophthalmoloyg, 2010. Sato M, Mizushima Y, Oshika T. Visco-shell technique with sodium hyaluronate2.3% in phacoemulsification of Morgagnian cataract. J Cataract Refractive Surg. 2008;34:1924-1827. Vasavada A, Singh R. Surgical techniques for difficult cataracts. Curr Opin Ophthalmol. 1999 Feb;10(1):46-52.